Few texts are more foundational and more influential than "The Wizard of Oz." The book, and perhaps more importantly the film it inspired, have been capturing the imagination for almost 80 years. Attempts to retell this fantastical fable in the years since have been mixed. Some have been truly spectacular, while others floundered under the weight of the story’s history. Syracuse Stage's audience is thankfully graced with the first of these options. The regional theater company’s production is light, fun and at its best completely winsome. Lani Corson in Syracuse Stage's production of "The Wizard of Oz." Photo by Michael Davis. Following Dorothy, the Tin Man, the Scarecrow and the Cowardly Lion as they travel through the magical land of Oz in search of their heart’s desires, the show departs from the film on which it's largely based in several interesting ways. Perhaps the most notable difference in this production is a function of its location. The stage may lack the scope and scale that film can offer, but it more than makes up for that by creating a transportive experience for the audience. Syracuse Stage has spared no expense on this production, which takes advantage of the company’s collaboration with 2 Ring Circus to create several marvelous sequences. Dancers and acrobats fly across the stage, buoyed only by ropes or hoops. It’s in these sequences, ones where the work of 2 Ring Circus is highlighted, where the production shines brightest. Kate Jarecki in Syracuse Stage's production of "The Wizard of Oz." Photo by Michael Davis. Although the cast is filled with young actors — Syracuse Stage partnered with the Syracuse University drama department for this production — there are no weak links. The world created by actors Brian Michael Hoffman and Crawford Horton as the Cowardly Lion and Scarecrow are particularly committed. Both are charming and willing to embrace the insanity that characterizes Oz. Kate Jarecki’s Dorothy is hopeful and endearing. Her delicate and precise “Over the Rainbow” serves as a reminder that the song itself is so beautiful because of its reliance on its singers prowess. Then there’s Dusty as Dorothy’s loyal dog Toto, who is carted around through most of the show, and is undoubtedly one of the best-behaved animals in show business. Thanks in large part to the show’s spectacle, and the commitment and talent of its cast, "The Wizard of Oz" is a success in spite of some problems inside the show itself. One number, in which the Lion explained how great he’d be as the king of the forest, was unnecessarily extended. There’s also the time spent in Kansas in the show’s opening moments, which worked in establishing much of the information needed for the show moving forward but could have been tighter. Especially in the second act, things began to drag, and for the first time it felt like the show took longer than it needed to to get to key moments. Still, director Donna Drake managed to create a show that, as cliché as this may sound, is sure to be fun for all ages. "The Wizard of Oz" is at its heart a simple story about a girl who takes an enormous journey in order to learn the value of staying at home. It’s a story about finding solace in what you already have and being grateful for it. It’s one where good conquers unambiguous evil, and one where all those who aren’t evil are good-natured, if you give them a chance to be. Oz is not the world we live in, especially not today. But this holiday season, it’s a good chance to escape for a couple of hours. Syracuse Stage's "The Wizard of Oz" will run through Jan. 7, 2018. Tickets and more information are available by calling the Syracuse Stage box office at 315-443-3275 or by visiting the Syracuse Stage website. Cast members in Syracuse Stage's production of "The Wizard of Oz." Photo by Michael Davis. Amy Jo Jackson in Syracuse Stage's production of "The Wizard of Oz." Photo by Michael Davis. Brian Michael Hoffman, Crawford Horton, Ben Franklin, Kate Jarecki, and Tucker Breder in Syracuse Stage's production of "The Wizard of Oz." Photo by Michael Davis. Tucker Breder and David Lowenstein in Syracuse Stage's production of "The Wizard of Oz." Photo by Michael Davis. Crawford Horton, Tucker Breder, Brian Michael Hoffman, and Kate Jarecki in Syracuse Stage's production of "The Wizard of Oz." Photo by Michael Davis. Crawford Horton, Tucker Breder, and Kate Jarecki in Syracuse Stage's production of "The Wizard of Oz." Photo by Michael Davis. 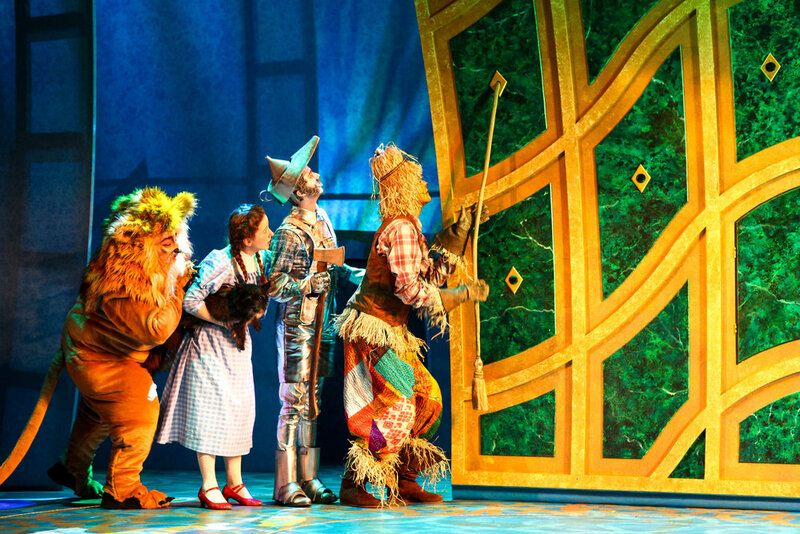 Crawford Horton, Tucker Breder, David Lowenstein (projection), Kate Jarecki, and Brian Michael Hoffman in Syracuse Stage's production of "The Wizard of Oz." Photo by Michael Davis. Crawford Horton, Brian Michael Hoffman, Kate Jarecki, and Tucker Breder in Syracuse Stage's production of "The Wizard of Oz." Photo by Michael Davis. Ben Franklin and cast members in Syracuse Stage's production of "The Wizard of Oz." Photo by Michael Davis. Brian Michael Hoffman, Kate Jarecki, Tucker Breder, and Crawford Horton in Syracuse Stage's production of "The Wizard of Oz." Photo by Michael Davis. Kate Jarecki, Tucker Breder, and Crawford Horton in Syracuse Stage's production of "The Wizard of Oz." Photo by Michael Davis. Crawford Horton in Syracuse Stage's production of "The Wizard of Oz." Photo by Michael Davis. Kate Jarecki and cast members in Syracuse Stage's production of "The Wizard of Oz." Photo by Michael Davis. A recent graduate of the University of Rochester, Joseph Allen is eager to continue studying film and television criticism at Newhouse. He has interned with Paste magazine, Women and Hollywood, and TV Guide. Joseph has also written for Screen Rant, Hidden Remote and several other online outlets, and hopes to become a television critic after finishing his studies. In his tiny amounts of spare time, he plays guitar in a band, and he’ll argue with you about the ending of “Lost” until he's out of breath.